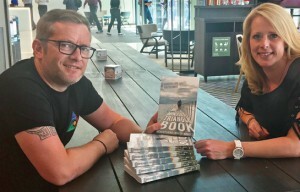 Henriette Lang and Stu Baker wrote The Mindset Triangle Book to help reduce the stigma around mental health. Both have personal experience of living with depression. Henriette’s father suffered with depression and Stu has lived with depression and anxiety for the past decade. He stayed silent about it for years but now talks openly about his condition. Their collaborative book focuses on the lifestyle triangle – sleep, healthy eating and exercise. The authors say people who seek to improve these three areas of their lives can enjoy improved mental wellbeing. The Mindset Triangle Book also introduces readers to a “SMART” approach to setting goals: they should be Specific, Measurable, Achievable, Realistic and with a Timeframe. The book has been developed in a scrapbook style, with shopping lists and easy-to-follow recipes for healthy living; workout suggestions; tips for better sleep; inspirational quotes; and interviews with high-profile personalities who have experienced mental health issues. There are also pages where readers can make their own notes on adapting the recipes or creating their own exercise routine from suggestions given.